It’s fast approaching. Barbecues, parades, and most importantly-fireworks! That’s right, Independence Day is right around the corner and where and how do you plan on spending your 4th of July weekend?!! There are a bevy of locations around the Seattle area to experience the festivities and take part in the action. If you’re not going to the Family 4th at Lake Union celebration (which you should be because it was almost canceled and yours truly donated to help keep it alive! ), there are other places that you can celebrate the good ol’ USA’s birthday! Below is a list of a few alternatives. This event will take place on Saturday July 3rd at noon and will feature live music and games. This event is great for families with children. On Sunday, the Seattle Civic Band will have its annual concert featuring patriotic classics. The celebration begins in the morning with a pancake breakfast and the parade begins at 1:00 p.m. on Sunday. Located at the Center House in Seattle Center, the newest American citizens will take their vows on Sunday starting at noon. This event takes place at the Bellevue Parks Family Fun Zone from 2:00 p.m-8:30 p.m. on Sunday. The parade downtown begins at 3:00 pm on Sunday. Museum of Flight’s The Twenty-Seven Flags of the U.S. The celebration salutes all 27 versions of the American Flag over its history and takes place between 10:00 a.m. and 5:00 p.m. on Sunday. Beginning at 7 p.m. on Sunday, there will be music, dancing and a place to view the Lake Union fireworks. Taking off in Kirkland at 8:00 p.m. Sunday, passengers will enjoy the buffet and viewing of the fireworks. If you decide to skip the big activities and enjoy the festivities privately, there are plenty of places in Seattle that offer a view of a fireworks display. 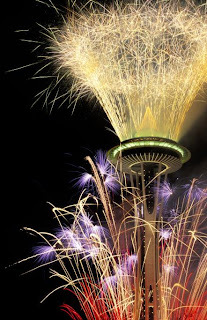 Regardless of what you plan on doing, have fun, be safe, and remember: Fireworks are illegal in Seattle (aside from those used in shows requiring a city permit) so just stick to ground spinners and sparklers. Happy 4th of July! !